Last post I described my house mates. More my “head mates” really. Personifications of the voices that used to yammer away inside. I’ll tell you, I promise. But first, I want this post to be an inspiring look at what life can be like without the inner dysfunctional family having a constant go at you. 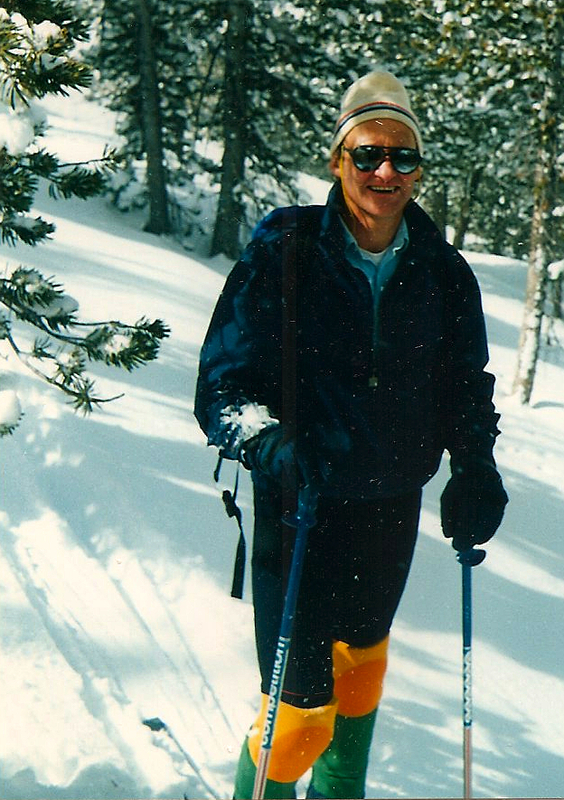 Here he is, climbing up a peak near Sun Valley Idaho one sunny March day back in the late 1980s. Can you tell from this photo how unusual he is? I couldn’t, at first anyway. As we climbed a snowy hill together I had no idea what an impact he would have on my life. Until I watched him ski. Three things became apparent once we reached the highest point. He was totally up for the challenge. Learning something new, under duress, with an audience has never showcased my best self, I gotta admit. So, not optimal conditions for Colin. He was a visiting Kiwi (those of you who know New Zealanders will recognize this as a code term for up-for-anything) whose Bucket List included some snow time. He’d accepted an invitation to play in the mountains around Sun Valley on borrowed equipment and it had never occurred to him (nor us, apparently) to talk about how to use the darn stuff. 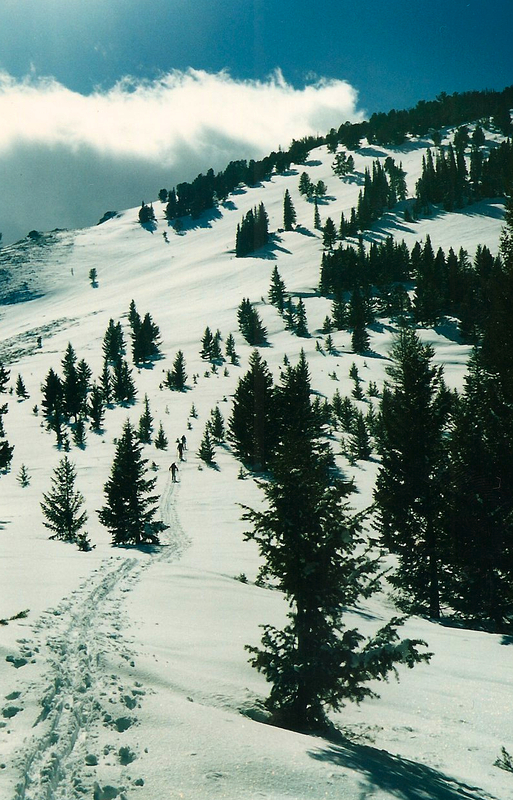 We all used thin, highly cambered, light-weight cross-country skis, long poles, and low leather lace-ups. 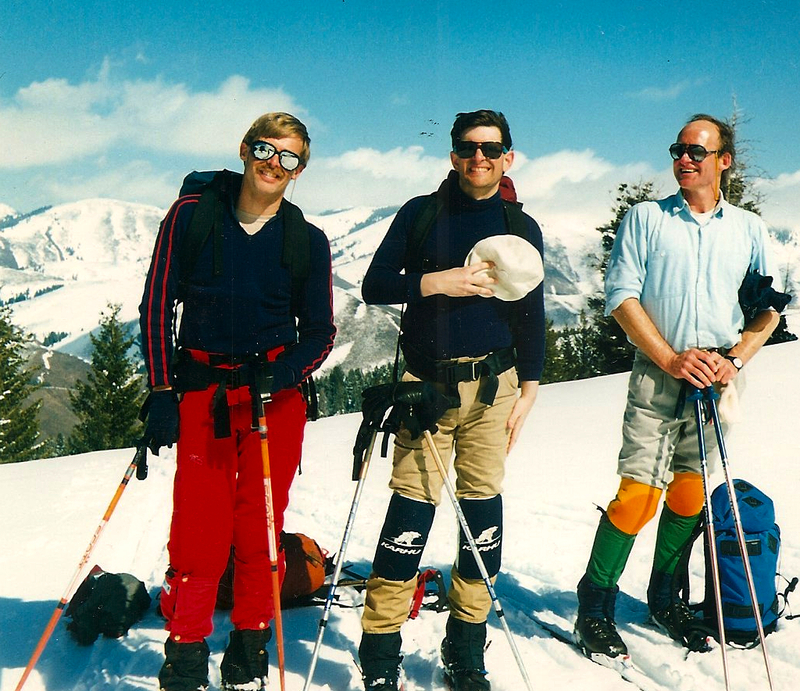 (Remember – we’re back in the 1980s all you hard-core mountain folk who ski anything today on short, wide skis and knee-high plastic boots). Here we are near the top, still smiling. Climbing skins off the skis, we’re ready for the descent. Colin’s looking at Karl (middle) and my husband Mark (left). We’re laughing because Colin’s just mentioned he hasn’t skied before. We’re sure he’s pulling our legs and will soon zoom down in a series of elegant linked telemark turns. So when Colin, still chuckling at our disbelief, pointed his skis down the hill and crashed spectacularly into a shrub about 30 feet below us, we all paused. We all gave our versions of how to (essentially back then) genuflect down the mountain. I found a fun old video if you’re interested! And Colin applied himself. He did what we suggested and of course, fell down a few times. It’s a tough turn to master on smooth terrain, and here was Colin on a wind-swept mountain. We’d make a few pointers and he’d try again. Within about 300 feet of the summit, he was linking his first few turns. Karl and I had taken some spills too and was I speaking so gently, thoughtfully and constructively to myself? Versions of this went on for the entire descent. Colin, who had no experience of using the telemark turn on cross-country skis, loved himself down the mountain. At each turn he was celebrating accomplishments and gently correcting his setbacks. He was never mad at himself, only curious and brave and confident he would eventually master the turn. There was I, hating and berating myself down the hill, same as I had for the previous six years of learning how to ski. I doubt my skills advanced at all that day. Colin mastered a new skill by allowing his core Self to take the lead. and ever so much more fun to live with! Over a warm drink later that night I asked Colin how come he wasn’t disgusted with himself when he fell, or critical of himself when he didn’t get something right, or grumpy or pushy or skeptical or any of the voices I seemed to activate in the face of a typical day. Next: How Colin silenced his inner critic (and all those other tough inner-relations) and learned how to lead from his Core Self. This entry was posted in Loving Myself, Personal Growth and tagged Core Self, how to love oneself, inner critic, inner self, inner skeptic, loving oneself on June 26, 2013 by gemmautting. Sorry Robert. Building the tension, and all that. Glad you like Colin though. I love this link Claire – especially this: ” My voice as the critic is only one voice.